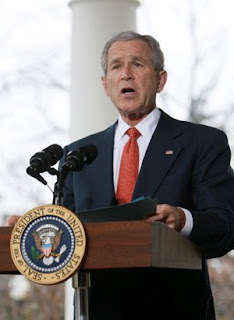 Whopper's Bunker: Bush all for Torture - This is a good thing! It is with renewed admiration for the faultless policies of the Bush administration that I tell you that on Saturday President Bush vetoed a bill that would have banned the CIA from using simulated drowning and other coercive interrogation methods to gain information from suspected terrorists. Bush said such tactics have helped foil terrorist plots such as the ones against a Marine camp in Djibouti, the U.S. consulate in Karachi, Pakistan, and plans to fly passenger planes into a Los Angeles tower or London's Heathrow Airport and city buildings. The bill would have limited the CIA to 19 interrogation techniques that are used by the military and spelled out in the Army Field Manual. Bush said he vetoed the measure because it is important for the CIA to have a separate and classified interrogation program for suspected terrorists who possess critical information about possible plots against the United States. "Were it not for this program, our intelligence community believes that al-Qaida and its allies would have succeeded in launching another attack against the American homeland," the Commander in Chief said. Bush said he did not veto the bill specifically over waterboarding, which the Army banned in 2006. The CIA, which also prohibited the practice in 2006, has acknowledged using waterboarding on three suspected terrorists in 2003. Waterboarding remains in the CIA's tool kit. The technique can be used, but it requires the consent of the attorney general and president on a case-by-case basis. Bush wants to keep that option open. "I cannot sign into law a bill that would prevent me, and future presidents, from authorizing the CIA to conduct a separate, lawful intelligence program, and from taking all lawful actions necessary to protect Americans from attack." In a memo to CIA employees Saturday, CIA Director Michael Hayden said the Army Field Manual does not "exhaust the universe" of lawful interrogation techniques. "There are methods in the CIA's program that have been briefed to our oversight committees, are fully consistent with the Geneva Convention and current U.S. law and are most certainly not torture," Hayden wrote. Lieutenant Colonel Creedon of the United Nations Extra Terrestrial Invasion Defense Agency said in an interview: "I remember being subjected to this at SERE school, I won't say it was great fun like the sensory deprivation test but the democrats and bleeding heart liberals only focus on the negative effects. They should try it and see why it's not all that bad." In a statement later The Colonel added that US forces working for UNETIDA are bound by US law only for the interrogation of homo-sapien prisoners and the majority of their work is unaffected by any such changes in law.